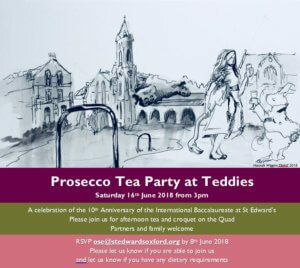 Join us for a Prosecco Tea Party in the St Edward’s Quad in celebration of the 10th anniversary of the International Baccalaureate at St Edward’s. In what is also the 50th anniversary of the IB worldwide, we hope you can join us for afternoon tea and croquet in the Quad with your partners and family. If you would like to attend, please RSVP by Friday 8th June, by emailing ose@stedwardsoxford.org along with any dietary requirements you or your guests may have.